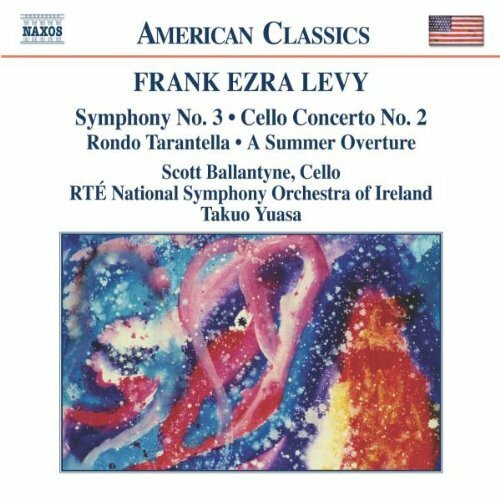 Frank Ezra Levy: Symphony #3, Cello Concerto #2, etc. RTE National Symphony Orchestra of Ireland, Takuo Yuasa conducting. Anyone who assumes that orchestral music written in the 1990s and 2000s must be either abstruse racket or spare minimalism would be surprised by this set of compositions by the American composer Frank Ezra Levy, of whom I had never heard before snapping up this disc. This music makes good use of the strength and versatility of a modern orchestra, but seems to reach back to the late Romantic period, thus ignoring at least a half century of music history -- which is not necessarily a bad idea. In fact, as I write this I notice a quote from Levy in the liner notes: I have embraced the work of some twentieth century composers... and have avoided other currents of the time, such as serial music. He goes in big for dramatic orchestral effects, which makes many passages seem a bit like film music. If this sounds like a nice way of saying that I thought it was competent, but wasn't particularly moved by it, well, then we are speaking the same code. It is probably pretty stirring stuff in person; in recording, or at least in this recording, I am not sure it is done justice. Decision: I will hang on to this disc, as it makes one feel very intellectual to have "classical music" on hand that was composed within the last ten years. Back in 2008, I did a post on jazz that turned out to make a big change in my music-listening habits. Before that post, jazz probably made up at most 1% of my music-listening diet. These days it's probably over 5%. That's a fairly serious change for an old dog. I asked for recommendations in that post, and one of big favorites was posted by still-around-after-all-these-years reader Nichim. She told me I was almost certain to like Herbie Hancock's Sextant, and golly! she sure was right. It's one grooOOoooOOoooOOoovy record. That's right. One grooOOoooOOoooOOoovy record. That's what I said. 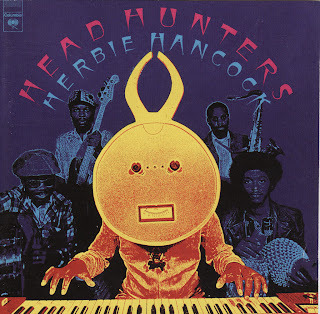 It says here on the back of the 1992 reissue of 1973's Head Hunters that it is "the largest selling jazz album in history." Well, that's as may be, but it's no Sextant. It has a pretty good fusion-y crossover groove, which is likable enough (although to be sure a fusion-y crossover groove in itself just makes some people grit their teeth). Decision: Sextant will stay in my Castle5000 lair, but Head Hunters will join the collection at work that is good enough and energetic enough to enhance my office productivity, but no so good as to be distracting. If you are thinking "that's sure damning it with faint praise!" we are once again speaking the same code. I have never been especially interested in solo piano music that isn't by Beethoven, but Niece #2 is into Chopin and it has rubbed off on me some. The Polonaises are extremely approachable and playful; they seem less like tuxedo classical music than sweater and khakis classical music, if you see my point. On this no-frills budget disc, they seem pounded out a bit bluntly to my ear. Well, maybe they are supposed to sound this way. Also, Harasiewicz probably didn't get any favors from the production team; these recordings are from the late 1960s, and the disc likely dates to the heyday of the compact disc fifteen years ago. At that time, I've been told, budget classical discs were what was used to keep CD factories busy between real orders because that was less expensive than turning the machines off and then turning them back on again. This lends a real hit-and-miss quality to them: sometimes a budget recording is a real gem, and sometimes the music on the disc doesn't match what's printed on the label. Whee! Decision: Not having much Chopin, I'll hang on to this Chopin. Can I borrow your copy of Headhunters?